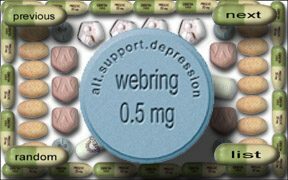 Here are resource links for users of alt.support.depression and related newsgroups. The latest version of the alt.support.depression Frequently Asked Questions File is available in html on Janne's Mood Disorders server in Finland. The RTFM FTP server at MIT keeps the official archive, while the Internet FAQ Archive offers the file by http. In the same server directories are the Mood Disorders Bibliography by the Self-Help Informatics Coalition and An asd Sampler and My Book List by Stewart the Metaphor Man and Great Defender of the Self. In England, Oxford mirrors the official site and adds a mailing list pointer. You can search the FAQ file at Ivarch's Twilight Depression Resources. The alt.support.depression User Guide came out of Alan Harding's Notes for Newbies file. Existing outside of the Usenet in the anarchy of the alt category where lunatics and terrorists abound, alt.support.depression has developed a netiquette peculiar to the group. Alan offers a description of "how to get the best from asd, and how to put the least extra stress into it." The ASD\R Ark is no ordinary ark, it's an online photo album of the pets who look after many newsgroups users. The ark is maintained by Skorch and includes a Christmas Party Photo Album and the rules of responsible pet care. Diane Wilson's ASD People and ASD Resources pages provide many valuable links for newsgroup users who are dealing with recovery and support as well as depression in general. Her flame retardant is very useful for soothing troublesome emotions related directly to newsgroup use. The asd/f/r#freeasd Pics pages is a virtual portrait album for users of the newsgroups and irc channels. anon.twwells.com is an anonymous server. You can use it to participate in any of the support newsgroups. Send a blank email to help@anon.twwells.com to get the process started.